Whispers float in the darkness of an empty auditorium. Feet and metal chair legs scuffle across a wooden stage. The din subsides in a moment of anticipation. Suddenly, the blackness is sliced open by a short bar of white light emitting a deep, otherworldly buzzing, like an ignited lightsaber. The floating horizontal line dips vertically to the right; the sound’s pitch intensifies. As the bar swings to the left, the tone climbs higher, completing a sort of electronic scale. The shadow of a gloved hand appears to strum the rod, sounding a single, flashing note. Then, a series of notes creates a strobe effect that, to adjusting eyes, barely illuminates a man in a dark hoodie who appears to play the beam like a broomstick guitar. White radiance turns to green to purple to blinking blue and red in a laser-show dance to an alien rock solo of robotic tones. After a frenetic crescendo of beeps, tweets, and bops, the light fizzles and withdraws into darkness. The house lights go up to a smattering of applause from the two dozen or so people seated onstage in front of Chet Udell, a professor of biological and ecological engineering from Oregon, who has a seemingly ordinary fluorescent bulb hanging from a guitar strap over his shoulder. Udell explains that by using LEDs, some customized software, and more than a little imagination, he converted a shop light into the Optron, the novel musical instrument they just heard. At least 16 members of the gallery appreciate the difficulty of this achievement—as well as its creativity. They, along with Udell, are semifinalists in Georgia Tech’s ninth annual Guthman Musical Instrument Competition, a Star Wars cantina band-meets-science fair contest that attracts inventors from all over the globe. Participants battle for a $5,000 first prize while providing glimpses of what music might sound like in the future. Tech rolled out the rebooted Guthman in 2009. Since then, it has grown to attract submissions from engineers, musicians, students, artisans, and designers in dozens of countries. In 2017, 85 applicants submitted presentations, videos, audio recordings, and schematics of inventions. The faculty then invited 20 semifinalists to come to Atlanta (three were eliminated for visa issues) and demonstrate their instruments before three judges, recruited from different realms of the music industry—performers, academics, and tech-company executives. The panel watching Udell and company consisted of Mike Adams, CEO of Moog Music; Elaine Chew, a professor of digital media from Queen Mary University in London; and Daedelus, a producer and electronic musician. Each year, the judges observe and query contestants and even try playing the inventions. Then, they winnow the field to seven to nine finalists who perform in a public concert at the Ferst Center. (The 2018 performance will be held March 8 at 7 p.m.) After the show, first, second, and third place divide $10,000 in prize money. A lucky few might even find buyers for their ideas. 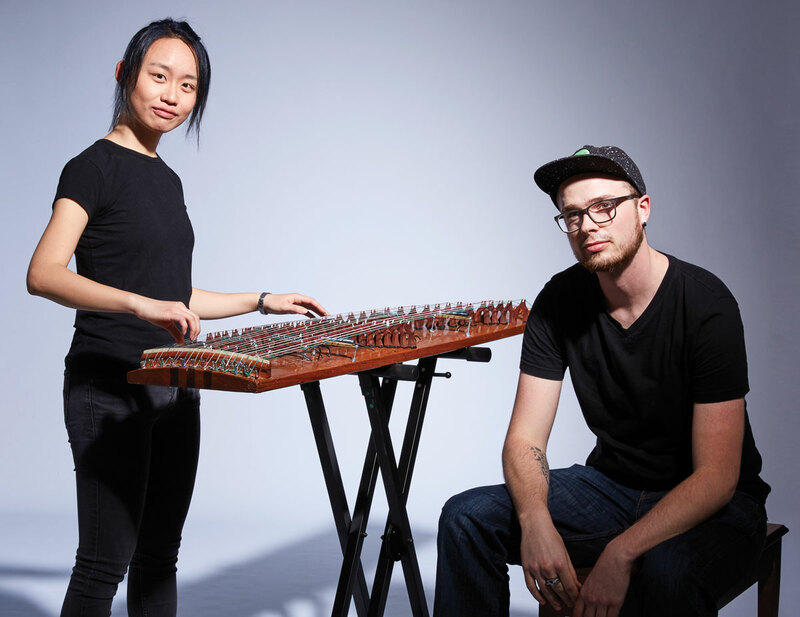 Previous finalists like the OP-1 portable synthesizer, the Roli Seaboard electric-acoustic keyboard, and the Guitarbot interactive instructional app have all gone on to commercial success. The judges have an unenviable puzzle to solve. The only entry criteria is crafting a virtual or physical instrument that generates sound acoustically or electronically, an infinite orchestra of possibilities. Udell’s Optron demonstration was followed by fellow semifinalists playing everything from the “Track It/Zip It” vest, wired with sensors that trigger electronic notes and melodic loops, to the primitive, 10-foot-tall Trombo Moderna that was merely wood and two strings modeled after an ancient Scandinavian harp. Amid that cacophony, the judges evaluated three factors—engineering, design, and musicality—and picked the winners. The house lights went off, the stage lights down—the Optron buzzing and glowing in a yellow-green hue until Udell bent down to pull the plug, leaving the stage in shadow. The Material and Magnet—Rhythm and Timbre (MM-RT) uses magnets and actuators to vibrate circular pads on a console. Van Troyer places small objects or containers of cardboard, glass, or tin filled with knick-knacks on the pulsating pads to create a vast array of rumbling, jangling sounds. 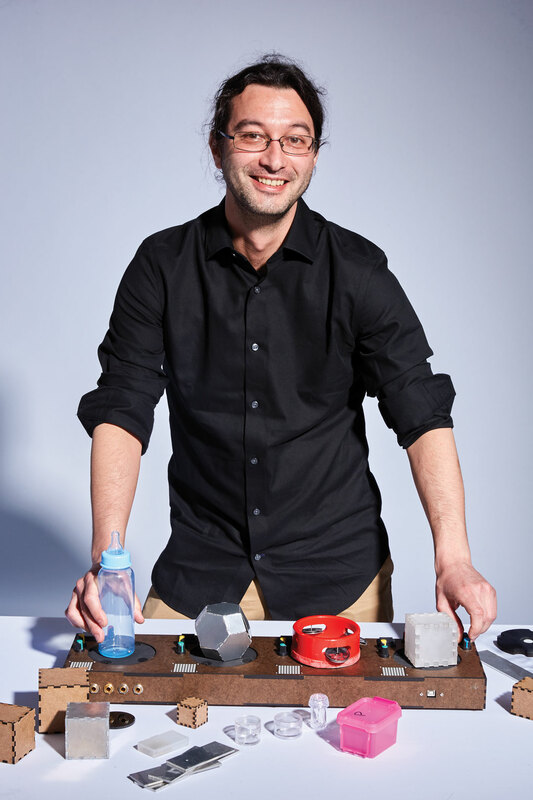 Like a DJ, he rotates combinations of jars and boxes to lay out textural percussion using everything from marbles to coins to a balloon. Once he hatched the idea, Van Troyer says he would just walk through dollar stores and tap on items to see how they’d sound. 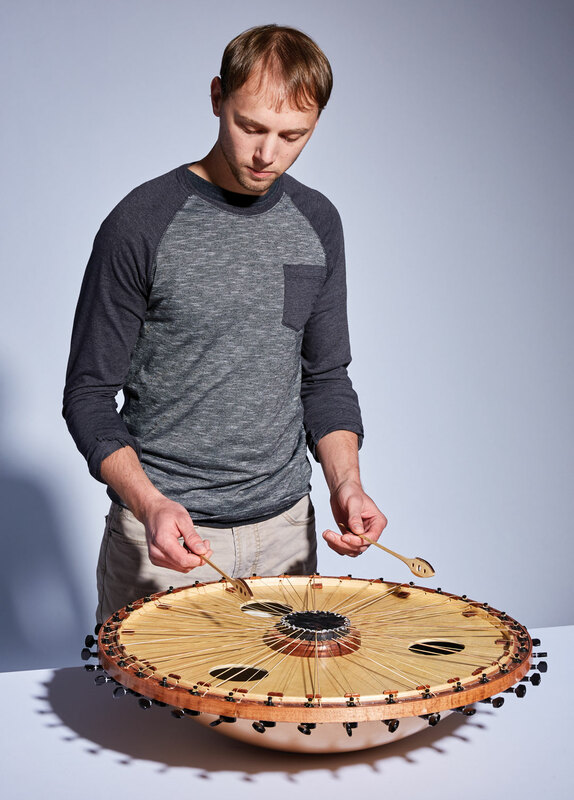 “You can turn everyday objects into musical instruments,” he says. It looks like a futuristic soprano saxophone, but instead of keys, remote-controlled slides on the top and sides trigger small hobby-helicopter motors on the woodwind. This can produce a range of 256 different notes per octave, as opposed to the 12 typical of Western instruments. 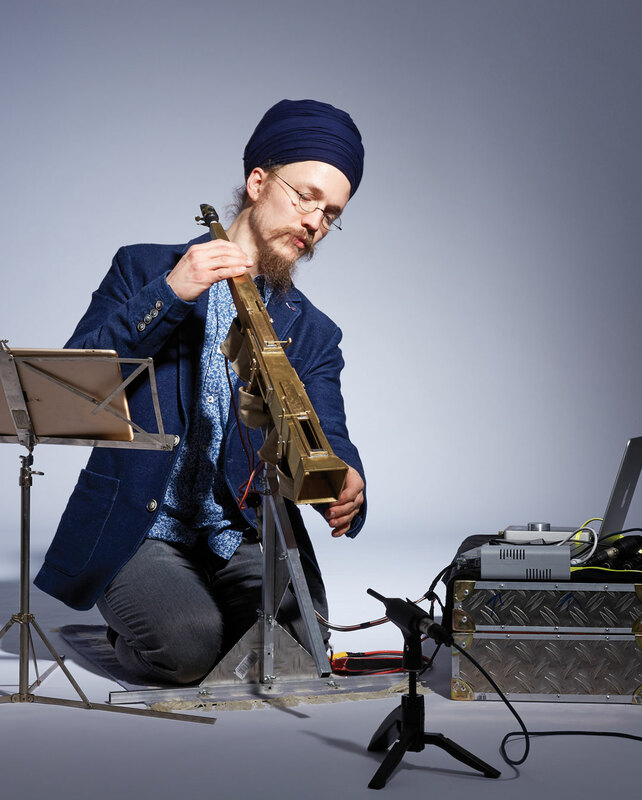 Singh says he sought to create an instrument that could enable players to “paint” with the infinite color palette of an artist—limited only by the composer’s imagination. 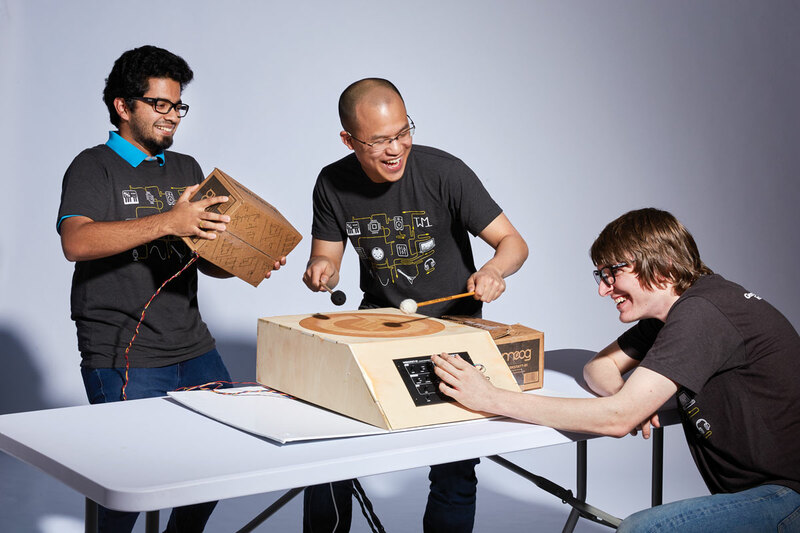 A wooden drum box is rigged with a Moog synthesizer that is placed in a cardboard box, which is lifted, lowered, swung, and even tossed between musicians to create a range of sounds that accompany the beat. This entry is the first-place winner from another Tech event, the 2017 Moog Hackathon, in which teams of students are given identical Moog synthesizers and 48 hours to conceive, design, and fabricate the most innovative instrument. Lyharp has a tuning mechanism that enables it to play all the notes in the chromatic scale, making it especially versatile. Special pickups also trigger preprogrammed accompaniment. The primitive appearance of strings stretched across a wood-topped steel bowl is deceptive. The 36 strings are doubled up, with half the strings played by a mallet while the other half resonate in harmony beneath. Plus, the Salimbaa is chromatically tuned, which means that the player need only turn the instrument a few degrees to change key. Byerly says that the idea of the Salimbaa came to him in a dream while he was doing mission work with the indigenous Manobo in the Philippines. As it turns out, his vision closely resembles an ancient Philippine instrument that had been lost to time. Now, Byerly runs a nonprofit that works with tribal peoples to “redeem” long-forgotten flutes, drums, and stringed instruments. 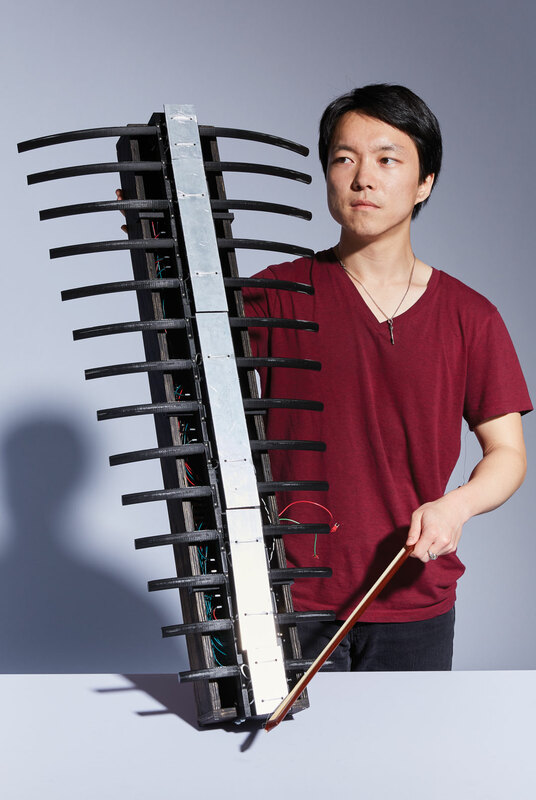 An electro-acoustic instrument, the Rib Cage is just that: a spine of aluminum bars lined with 3D-printed plastic “ribs” that can be struck with a mallet or sawed with a violin bow or even a comb to create a range of acoustic sounds. 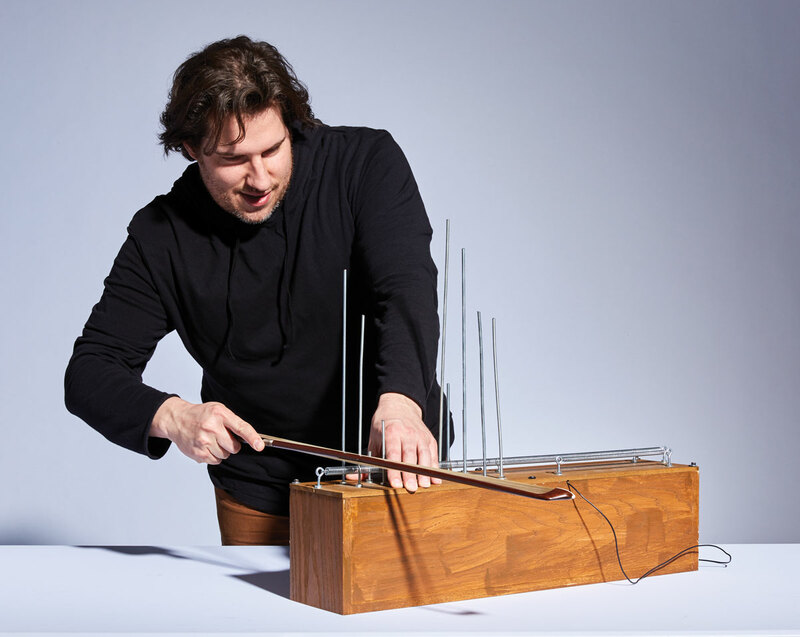 Appropriately, the Rib Cage’s electronics also produce a heartbeat pulse that quickens and subsides with the intensity of the percussion—resulting in a deeply primal musical experience. A pair of soft 3D trackpads respond to touch and pressure and translate those signals into sound. 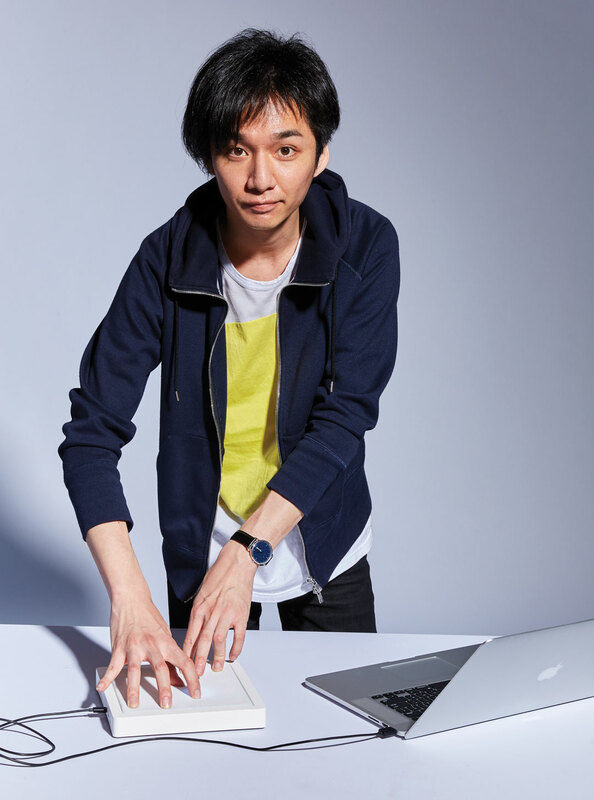 The instrument can play any genre but is best exemplified when Nakanishi “DJs”—producing a mix of electronic and techno beats. A wooden acoustic box contains a contact microphone that captures the sounds of the long screws and springs that are plucked, strummed, and struck on top. Netherton creates the percussive sound, records it, and loops it to create a complex piece of music. 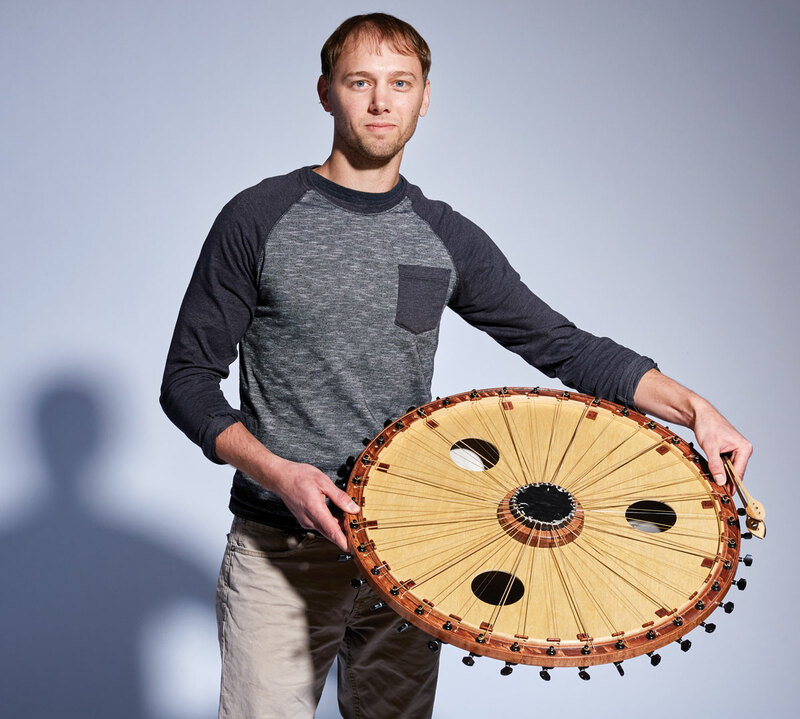 Netherton is a percussionist, fascinated by all things that can be struck to make a sound. “I walked into Home Depot, bought a bunch of stuff, cut it up, and hit it,” he says. 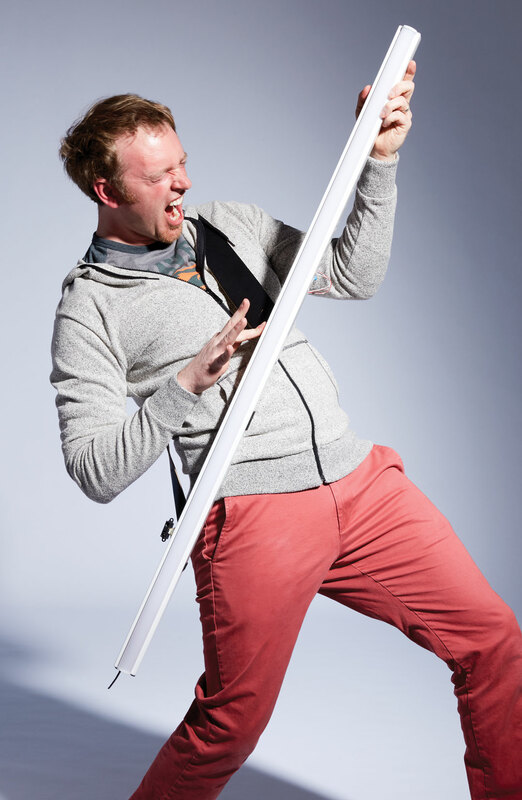 A shop light, some multicolored LEDs, a complex array of electronics (including a webcam equipped with a motion detector), and a laptop create this straight-out-of-sci-fi instrument that can be played by waving it around, running fingers up and down a sensor, or strumming it like an air guitar. Japanese noise artist Atsuhiro Ito created the first Optron, which was a buzzing fluorescent tube. Udell’s device reminded almost everyone, young and old, of phantom duels with Darth Vader.